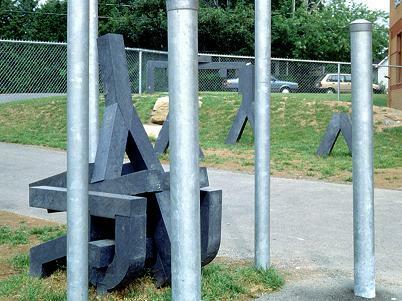 Located in the alley that children take to enter the schoolyard, this installation draws its formal elements from basic components of knowledge - letters and numbers. Children cross disordered rows of posts bearing the numbers and symbols of a fragmentary multiplication table. A direct indication to reconstruct what is shown as fragmentary or incomplete is behind the architectural work, conditioning the viewer's experience of it. 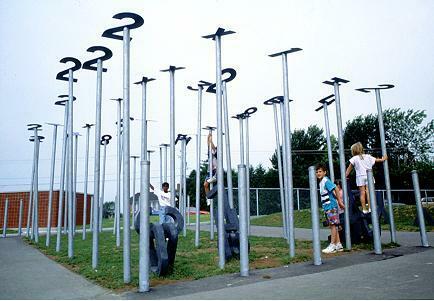 Thus, schoolchildren walk through a series of poles placed in a disorderly manner and bearing the fragmentary figures of a multiplication table.